The Master Bedroom from our Minted Interiors Coast project. A space designed to create a relaxing, bohemian coastal style to compliment the incredible views. A home tour of our latest interior design and styling project. 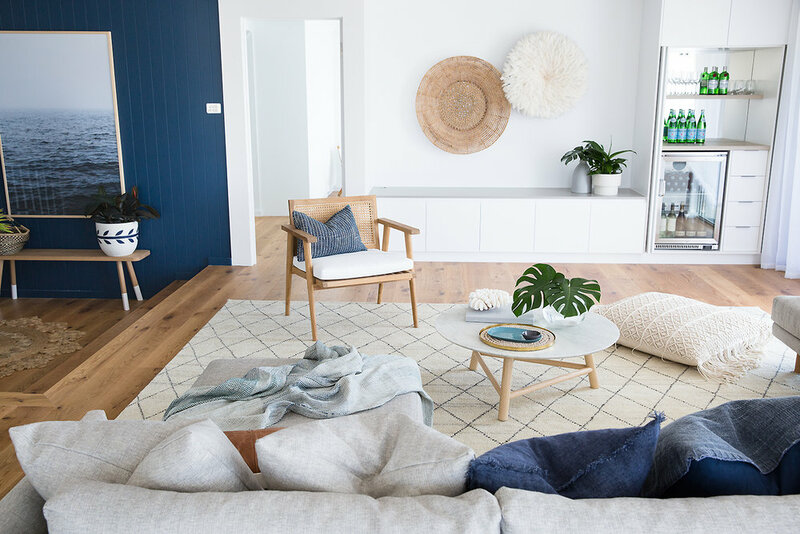 A Contemporary Australian Coastal Boho beach house - Minted Interiors Coast Project. 'Blooming Brookhaven' - a style collaboration with Naturally Cane to celebrate their beautiful Brookhaven Cane Bedhead. I'm so excited to finally share our new Minted Interiors branding with you al, celebrate some of the achievements so far and share a little about what's to come. Six kids under seven in a foreign country - what could possibly go wrong? The Vittoria Iris Chaise Sofa by Globewest. This style comes in different sizes and configurations to suit almost any space. It also has commercial stain resistant technology built into the material and removable covers if you ever need to throw one through the wash, so it's perfect for little kids, which is exactly why we have one at our place! My top five tips for buying furniture - what you NEED to know. Kye's Room - bright pops of colour and punchy wow factor for this adventurous nine year old.